How much money can Australia afford to spend on defence in the long-term? The conventional wisdom is that Australia faces daunting fiscal pressures in the decades ahead due to its ageing population and the rising cost of health care and other social services. 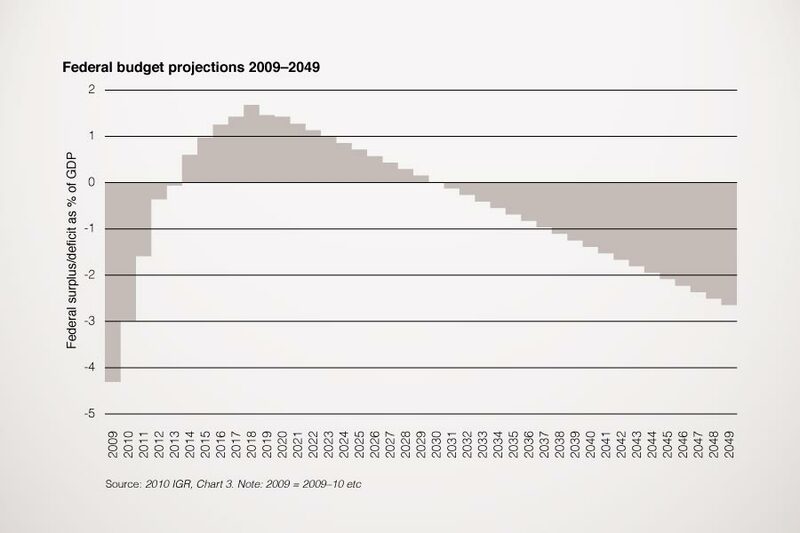 As argued in successive Intergenerational Reports produced by the Treasury, on current policy settings Australia will slip into steadily increasing deficits around 2030 (see below, click to enlarge). It looks dire, but it’s actually a very poor argument for constraining defence spending. To start with, Treasury’s modelling is based on the arbitrary assumption that federal tax revenues will remain a fixed percentage of GDP. The reality is that Australia’s tax-to-GDP ratio including all levels of government (which is what matters economically) of 27.1% is low by international standards (source: OECD tax database). In fact, in 1965 Australia’s tax-to-GDP ratio was just below 21% but it has risen roughly in tandem with the growth of our economy since then. It would not be an economic catastrophe if taxes were to rise, especially if we adopted reforms that made our tax system more efficient. What’s more, on Treasury’s own projections, Australians will be able to enjoy an expanded combination of private consumption, social services and public goods in the years ahead. In terms of per-capita GDP—a rough measure of individual prosperity—the result is a 79% increase from around $60,000 in 2009 to over $107,000 in 2049 (measured in 2009-10 dollars). Far from worrying about going broke, we should be thinking about how to best take advantage of our growing prosperity—perhaps even by bolstering our security—even if it means paying a little extra tax. Even if a fixed tax-to-GDP ratio made sense, defence spending warrants special consideration—not because it is intrinsically more important, but because it amounts to what economists call a public good. To illustrate, if the government cuts expenditure on health or education (both private goods), individuals will spend some of their own money to at least partially restore the level of service—with the added benefit of more discerning consumption probably driving more efficient provision of those services. But individuals can’t buy defence; so every dollar withdrawn by government is exactly one dollar’s worth less defence. Ultimately, it doesn’t matter at all whether spending on defence can be shoehorned within some arbitrarily chosen tax-to-GDP ratio. We can spend more on defence in the decades ahead if we want to. The right question to ask is whether defence spending delivers greater benefit than the alternatives—be they better social services, lower taxation or whatever else. As it happens, I think that Australia can responsibly spend less on defence than envisaged back in 2009. But that’s not because of spurious arguments about ‘affordability’. A longer version of this argument that more fully explores the fiscal and economic (i.e. cost-benefit) perspectives on defence expenditure is available here.